Rustan’s chairman emeritus Bienvenido Tantoco Sr. (center) leads the grand launch of the new Rustan’s Cebu with (from left) Rustan’s president Donnie Tantoco, Rustan’s VP for store planning and expansions Michael Huang, Ayala Corp. president and COO Fernando Zobel, Rustan’s chairman and CEO Nedy Tantoco, Rustan’s board member Maritess Tantoco-Enriquez and SSI Group president Anton Huang. 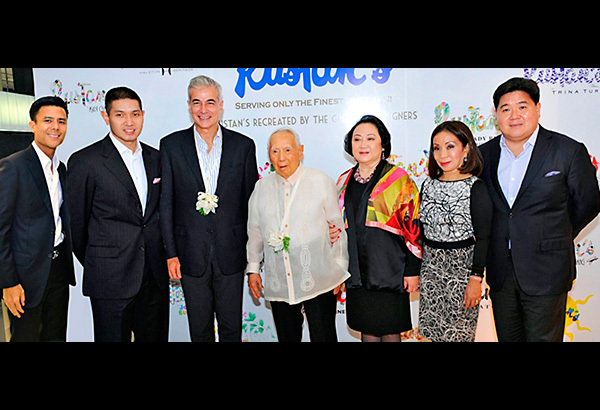 The launch of a new Rustan’s in Ayala Center Cebu last Friday, led by their 94-year-old patriarch Bienvenido Tantoco Sr., is not just about the Tantocos opening their signature elegant department store that redefines retailing in Cebu, acclaimed as the crown jewel of the south. It also signifies the belief of the Tantocos – hailed as the country’s luxe retailing royalty – in Cebu, which is second only to Manila in terms of development and infrastructure. She adds that it matches Cebu’s rise as a global manufacturing center and lifestyle getaway for the rest of the region. With an imposing facade and three spaciously gleaming floors devoted to top luxury global brands in cosmetics, fashion and homeware, Rustan’s Cebu likewise highlights local products, notably those of Cebuano design heroes Kenneth Cobonpue and Cary Santiago. For the opening week, it presents dining areas styled by Cebu taste setters Amparito Lhuillier and Teresin Mendezona. The opening was attended by businessmen and socialities from Cebu’s top 300, as well as by captains of industry led by Fernando Zobel de Ayala, who provided the retail space in their Cebu Ayala Center, and Alfred Ty whose Marco Polo in Cebu was the hotel of choice for the inaugural guests. Symbolically, Rustan’s Cebu also stands refined with a global aura, respecting the country’s history and culture yet going future-forward in its vision, just like the patriarch who began the first store in Manila in 1951 together with his wife, Glecy Rustia-Tantoco, in whose memory the store is dedicated. Present were four generations of the Tantocos – from Benny Tantoco who served as Philippine ambassador to the Vatican and is still active in his 90s, to the 21-year-old Christian Tantoco who is on summer break from economics studies at Boston University. Ambassador Tantoco led guests in touring Rustan’s Cebu, looking at the details put in by his daughter Nedy with his grandson Michael Huang overseeing the project as VP for expansion. Assisting him were his grandsons Gino and Eman Pineda of Adora, Rustan’s recent luxe store addition, and his daughter Maritess Tantoco-Enriquez, the family gemologist who is also his travel planner. danggit, longganisa and tapa with rice,” Maritess explains.